SILVER MEDALIST FOR FOREWORD MAGAZINE'S BOOK OF THE YEAR AWARD IN THE CATEGORY OF HISTORICAL FICTION. A Democracy of Ghosts is the love story of four couples, set against the backdrop of the Herrin Massacre of 1922. This clash of miners and strikebreakers in Bloody Williamson County, in Southern Illinois, resulted in the deaths of 21 men -- 19 of them the "scabs" tortured and murdered by average men, women, and even children in what was once the most radical community in America. 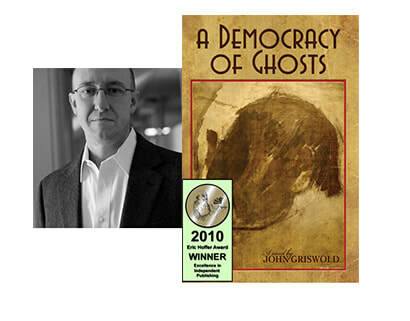 John Griswold has drawn from contemporary eyewitnesses and news accounts, an ethnography of the area, histories, and his own grandfather's letters to create the lives of four fictional couples whose ambitions, self-doubts, and social and sexual jealousies contribute to this great American violence that still echoes down through time. "At times disturbing and tragically violent, always insightful, poignant and uncompromising, Griswold's riveting narrative is filled with complex men and women bursting with life. Fast-paced and powerful, Ghosts is an original ride told by a masterful writer." "With iron and blood, it seems, and from the rich depths of the earth, John Griswold has fashioned a classic American novel, its dignified intonations of our young nation's sweat and tears evocative of the indelible storytelling of Dos Passos, Frank Norris, and Upton Sinclair." A Democracy of Ghosts has been selected as the winner of the Delta Award from Friends of Morris Library (University of Southern Illinois - Carbondale) in recognition of an individual or organization that has written/ published about southern Illinois with distinction. John Griswold joins such luminaries as John Gardner, Paul Simon and Robert Coover as winners of this award. John Griswold lives with his wife and sons in Urbana, Illinois, where he teaches at the Univesity of Illinois. HIs writing has appeared in Ninth Letter, Brevity and Natural Bridge, which nominated him for the Pushcart Prize, and in the anthhologies The Best Creative Nonfiction, Vol. 3 (W.W. Norton) and Mountain Man Dance Moves(McSweeny's Books). His single-story chapbook, The Stork, is available from Featherproof Books. He's currently at work on a nonfiction book about Herrin, Illinois, which will be published in 2010 by The History Press. John has also written extensively under the pen name Oronte Churm. As Churm, he is a contributing writer for Inside Higher Ed and as a columnist for McSweeney's.